SONY STEREO HARNESS FULL 16 PIN. Blue - Power Antenna(x2). COMPATIBLE WITH SONY RADIOS. Full 16 PIN. Black - Ground. COLOR CODED. Purple – Right Rear Speaker ( ). Purple with Black Stripe – Right Rear Speaker (-). This harness has 4 pair of speaker wires, Amp remote, Power antenna remote, Illumination, mute, Acc, Battery and Ground wire. With Illuminationa and Mute wire. This list is of known units this harness will work with. SONY STEREO HARNESS 16 PIN SIDE FUSE NEW 2012-2013 & 2014 RADIO MODELS. COPPER BLEND MATERIAL. This harness has 4 pair of speaker wires, Amp remote, Power antenna remote, Acc, Battery and Ground wire. So be sure to try harness to see if fits1st before hooking it up. This list is of known units this harness will work with. THIS IS ONE RADIO PLUG FOR SONY & SONY XPLOD. SONY MAKES 3 DIFFERENT RADIO PLUGS. be for you buy this plug, be sure to look closely at your radios plug hole and my pictures to see if this plug will fit your radio. Sony 16-Pin Plug. 12V Constant (Yellow), 12V Switched (Red), and Ground (Black). Sony XA-110IP Interface Adaptor for iPod. 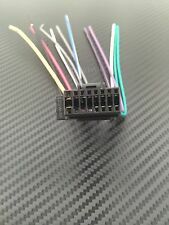 SONY CAR STEREO RADIO WIRE WIRING HARNESS CONNECTOR CABLE. Condition is New. Shipped with USPS First Class Package. Impulse SY16-00, Sony 16 pin harness. Be for you buy this plug, be sure to look closely at your radios plug hole and my pictures to see if this plug will fit your radio. if it fits and you radio works the plug will work. THIS IS ONE RADIO PLUG FOR SONY & SONY XPLOD. Used it twice, my car didn’t want a different radio to work, Took it out and tried it in a friends car, it worked. Got a new car so I don’t need it.